ABB’s Oliver Johnson looks at what government legislation promoting low and zero-emission transport means for electric vehicle charging and how contractors can make the most of the opportunity. How quickly is the market for electric vehicles growing? While the number of electric vehicles and other ultra low emission vehicles is low now, numbers are growing from 1.8 percent of new cars registered in 2017 to 2.5 percent in 2018. From the perspective of the electrical industry, it feels similar to the early days of solar photovoltaic installations a few years ago. Like solar power, the government wants the country to tap into clean energy but in this case the focus is on road transport. Not only will electric mobility help to limit the effects of climate change but by eliminating exhaust fumes it will have a more immediate effect to prevent health problems. As a result, we’re likely to see more clean air zones like ULEZ in London – and these will drive up demand for electric, hybrid and fuel cell vehicles for both private and commercial use. One example is the fleet of fully electric buses that Birmingham Airport will be introducing in November 2019, which will be charged at the terminal’s bus stop by an ABB OppCharge pantograph system. What are the use cases for EV charging points? In theory, you could install EV charging points wherever cars park. There are four categories of charging points that need to meet the needs of the driver and more importantly the use case of the vehicle. In general, sites that need to deliver faster charging need more power. Use cases for personal school runs and the weekly shop will be very different from a local taxi company running an airport shuttle service or a local delivery company delivering into a clean air zone twice day. At the low power end homeowners will be best off choosing a domestic wall-box providing 3-22 kW of AC power to provide a steady charge over 4-16 hours with no need to upgrade their incoming supply. In contrast, DC chargers capable of delivering 20-25 kW will be best suited to office and commercial buildings, multi-family housing, hotels and hospitality facilities, car dealerships and car parks. Drivers at these sites will be leaving their car for 1-3 hours of charging time. At the next step up, DC fast chargers with a 50 kW rating will be the minimum requirement to power 20-90 minute charging. Sites needing this level of service will include high turnover parking sites, supermarkets, big box retailers, restaurants and convenience sites, as well as truck stops on the motorway. The highest power sites will deliver charge in 10-20 minutes at sites where drivers are under pressure to charge and go. At these sites, DC high power points will deliver 150-350 kW or more, like the 350 kW Terra HP, which we introduced in 2018 to provide 120 miles of range in only eight minutes. Buyers of these systems include motorway service stations, city centre and suburban petrol stations. High power chargers will also be popular for charging electric buses and commercial vehicles. One thing that contractors can do to make the most out of EV charging opportunity is to develop an understanding of these types of chargers and how they could be used for a particular user. What is important when choosing EV charging points? Like all other forms of new technology, it’s important to think about the future and choose a charger that will offer the best value over a 10+ year service life. In practice, that means a charger should be compatible with the latest generation of the EV charging standards and be able to be upgraded remotely to ensure evolving standards are met over the life of the units. For some sites, chargers will need to be capable of delivering a constant flow of power with no need for cooling breaks. Whatever the installation, it’s important that the technology should be safe, secure and straightforward to install and maintain. We developed our charging technologies in partnership with the world’s leading vehicle manufacturers to ensure this is always a safe experience whatever the weather! Why is digital connectivity important? For charger point operators, both commercial and private, this is key technology to reduce wasted service trips and help the charger up time in the high nighties; the ABB Ability Cloud provides a secure platform to provide a range of service including payment, authentication and data handling. ABB’s system really allows the operator to see inside the unit to try and resolve issues without travelling to site. By choosing a charging point that has this secure web connectivity, electrical contractors and their customers can monitor a fleet of charging points remotely through a password protected web interface and keep their customers charging. How has EV charging technology been tested? 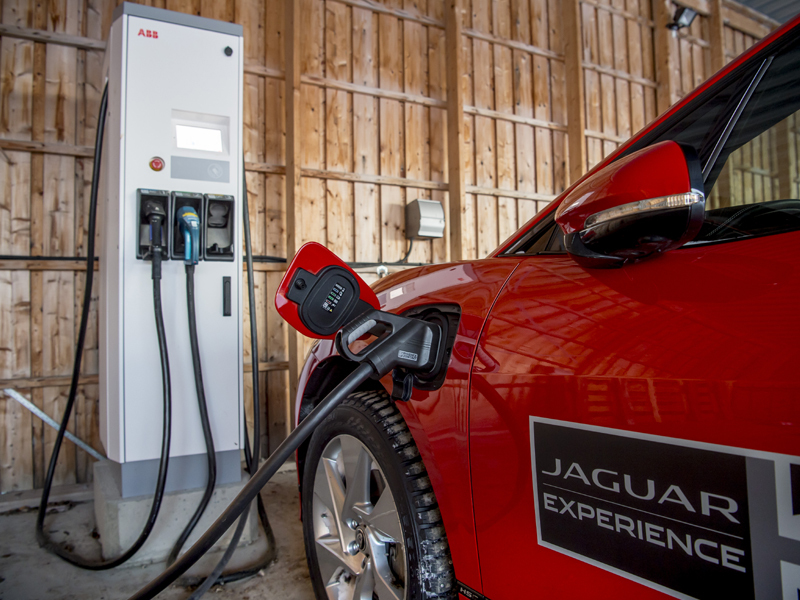 The true test of EV charging points will come over time in the field, when they have experienced the heat of summer, cold of winter and many charging operations. 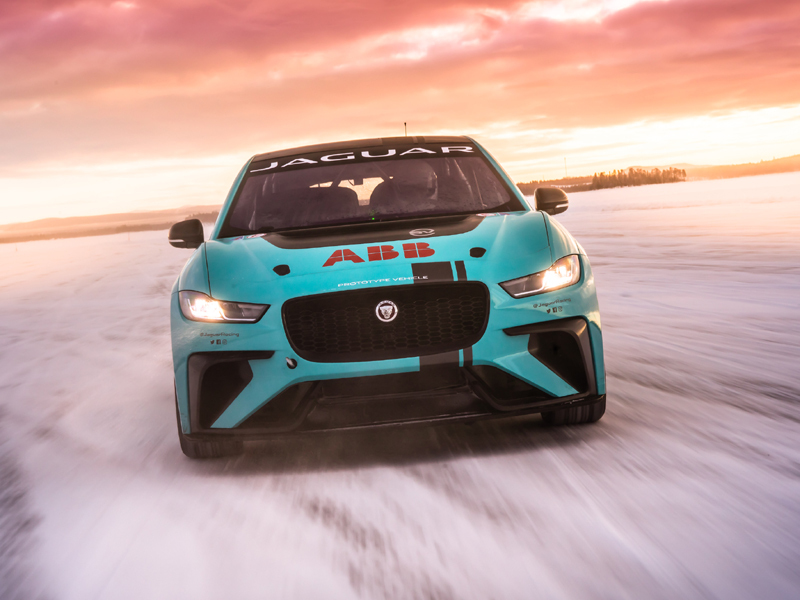 Therefore, being the title sponsor of the ABB FIA Formula-E championship and its support series the Jaguar I-PACE eTROPHY championship, we have taken the opportunity to test our fast chargers to the limits of the world’s road conditions from minus 35 to plus 55 degrees Celsius. 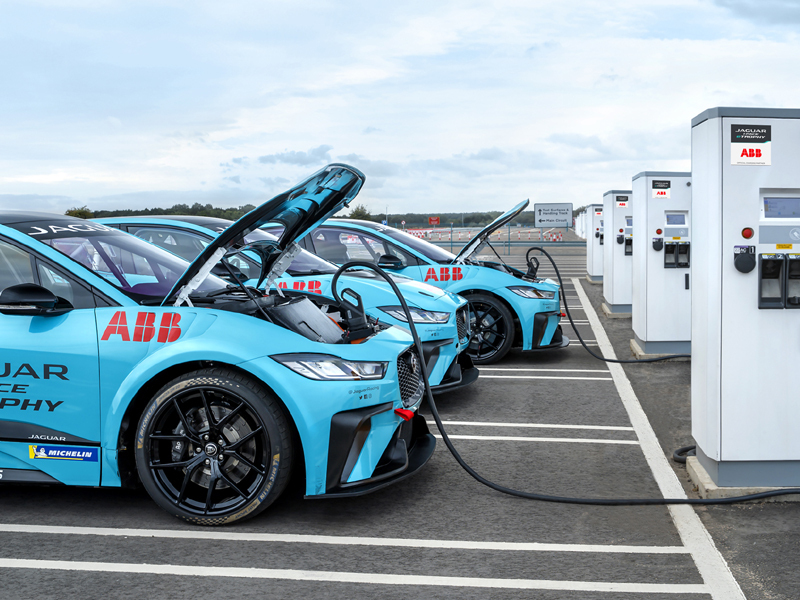 The I-PACE eTROPHY is powered by chargers based on the Terra DC class of chargers, which need to provide power in the breaks between practice, qualifying and each race. The chargers need to operate reliably in spite of varying conditions at 10 host cities from Ad Diriyah in the Saudi Arabian heat to Santiago in the cool of Chile. The Terra chargers for the racing championship are based on the same modules as the roadside versions. The only difference is that the race version is housed in a low-profile wheel-mounted cabinet with a shipping enclosure to fit inside aircraft cargo holds. 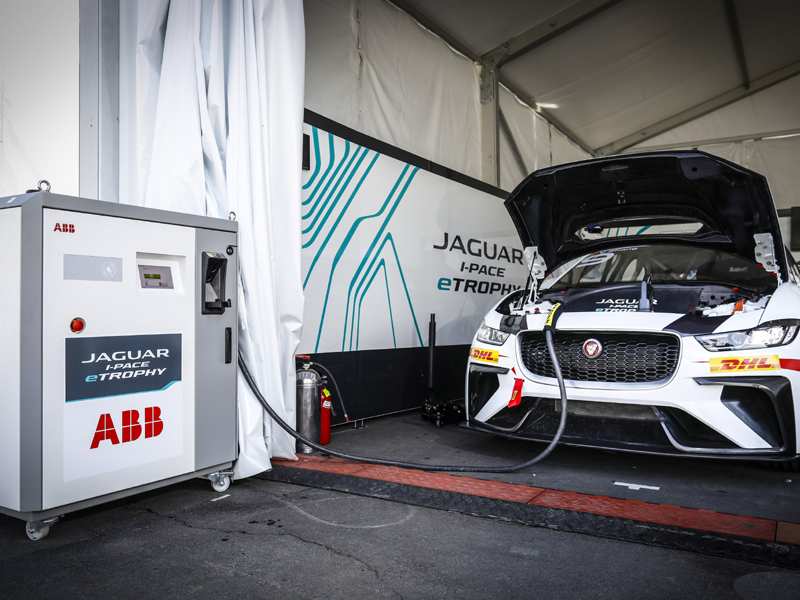 At one testing session at the Jaguar Land Rover Ice Academy in Arjeplog, Sweden, we tested charging of a Jaguar I-PACE eTROPHY racecar at temperatures well below its normal operating range and found it worked flawlessly.